The dark lands of ancient Egypt held many secrets and mighty power hidden throughout the desert sands. Lain in ancient pyramids designed to both protect the kings of Egypt and aid their spirits to ascend into the sky and become the sun, the pharaohs are the incarnations of the very divine powers on which they worship. Wielding scepters that decry their authority and wearing luxurious headdresses that depict the varied animalistic deities of the people, it is hard to say that they were wrong given that we still call upon their image even today. But, legends also speak of the Dark Pharaoh… powerful kings that with their inherited divine power did not wish to simply relinquish their forms and spirits to complete the cycle of life and death. Instead, they sought to perpetuate their own lives, to remain forever and keep the godly might that was rightfully theirs. Such disruptions to ma’at would bring down anger and curses from the gods and such a pharaoh might even rise as the most treacherous creatures of all ancient Egyptian myth: the mummy. But… that won’t happen to you! That happens to other dark pharaohs. The type who aren’t connected to the real world, who haven’t earned their long-lasting power and life! 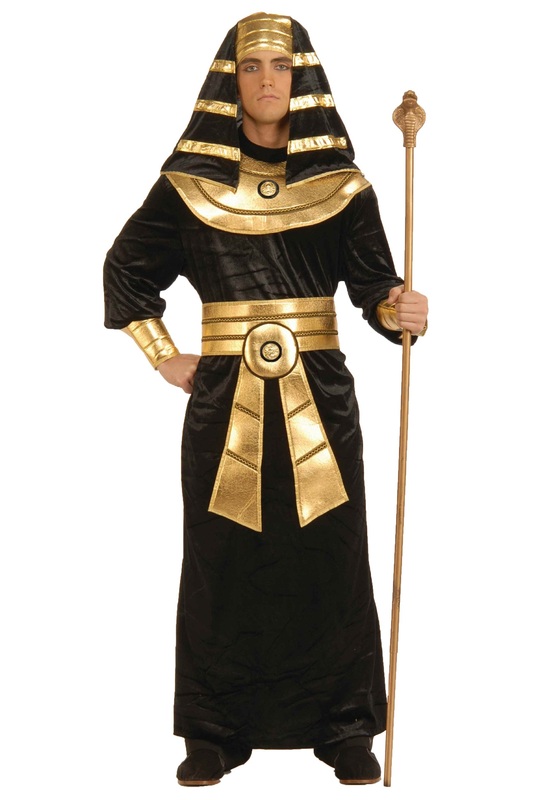 So, you have no fear in this Plus Size Black Pharaoh costume. The shining black robe provides a dark and mysterious base when contrasted with the golden finish of the belt and iconic regal collar. The matching black and gold headpiece frames your noble face and demands respect from your subjects. Now you only need acquire your mystical scepter and your immortality is ensured. Otherwise… there is always a mummy costume for next year! First time buying an costume on line. I will do this again. Good costume. I am 6 foot 1 and 250lbs. Would suggest getting staff to complete the regal look. Fits as expected, looks great, good price.